Setting up the SwannEye HD takes only a few minutes, with most of that time used to unpack the camera, power cord, network cable, and other accessories from the box. Plug the camera into your network and the accompanying SwannEye HD app automatically identifies the camera on your network. You can then configure it to connect to your secure wireless access point so you can operate the camera tether-free. Either manually enter the camera’s unique identifier affixed to a label on the bottom base of the device. Alternatively, an accompanying QR code can be scanned to faster facilitate your camera’s registration with Swann’s login service. It is via this service that you will be able to connect to and control your camera, regardless of whether your camera is connected within your own home network, a business local area network, or directly on the Internet. The SwannEye HD camera can be seated on a table or affixed to a wall or ceiling via the included mounting bracket. 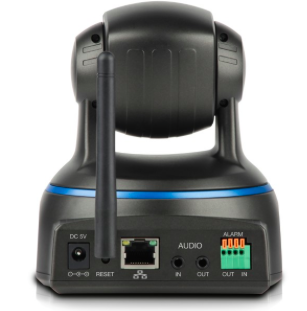 This provides the SwannEye HD with a great deal of flexibility, allowing you to use the camera in multiple security scenarios and experiment with locating the perfect position in which to operate it. The camera also features infrared vision that can make the darkest room light up with a high degree of clarity, perfect for monitoring sleeping babies or scanning a room for any disturbances in the middle of the night. And given the fact that it can swivel horizontally up to 350 degrees and tilt vertically up to 100 degrees, the field of view provides excellent coverage any area being monitored. It also has both a speaker and microphone, offering two-way audio communication between the camera and the computer or iPhone remotely controlling the camera. 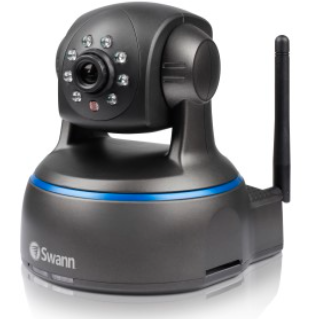 The SwannEye HD camera accepts standard SD Cards to record continuously, or for events triggered by motion. You can also receive alarm notifications via email when motion has been detected, and interrogate the camera’s recordings when you connect to it. Full-featured clients run on Mac, Windows, iOS and Android, and all look and function identically. Using the free SwannEye HD app on an iPhone or iPad is easy thanks to the program’s intuitive user interface. Swipe up or down, left or right to swivel the camera in that direction. Select the camera, video, microphone, or speaker icon to take a photo, playback of a recording, turn the camera’s microphone or speaker on or off accordingly. You can also switch between 720P (1280x720), VGA (640x480) or QVGA (320x240) video viewing modes depending on your bandwidth constraints. 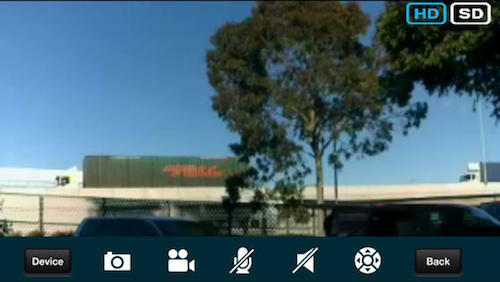 You can also record video and take photos via the SwannEye HD app, which saves it to the iPhone’s photo gallery. Everything works intuitively, from installing and configuring the camera to using the controls on both the iPhone and computer (the free SwannEye HD app can be installed on a Mac via the Mac App Store, and the Windows version can be installed either from the included CD-ROM or via download from Swann’s website). The only problem I encountered was an occasional lag or rare disconnect when swiping up or down too quickly for the camera to keep up with my demands. The SwannEye HD app is also not the most beautiful iOS program available in the App Store, but it’s functional nonetheless. Overall, the SwannEye HD is a remarkable piece of hardware at an affordable price. It offers features and flexibility often found in security cameras costing five times as much. If you’re looking for a feature-rich, attractively priced security camera for your home or business, the SwannEye HD is one product that will capture your attention (as well as your movement).